When NYT bestselling author Maggie Stiefvater arrives to an event almost two hours early, how does she waste time? She goes in search of kilts, candy, and kitchen contraptions. (Yes, this is how we came upon the suggestively shaped mango pitter last year before the Shiver launch.) Once again, I was privy to this pre-launch ritual. By the time I met up with Maggie, she had already obtained caffeine and a cookie and found her way into Williams-Sonoma. Of course she had to show me what she found there this time because it was too strange not to share. I mean, can you tell what this is? We played with hand puppets at the toy shop, found Beck and a baby Sam stowed away on a shelf, and mourned the loss of one wall of Breyer horses. To Maggie's dismay it had been replaced with John Deeretractors. Wythe Candy beckoned, full of fragrant and beautiful confections. It is every bit as enticing as it sounds in candy shop scene in Shiver, which the store inspired. Barely inside the door, we were confronted with death apples. What is a death apple you ask? 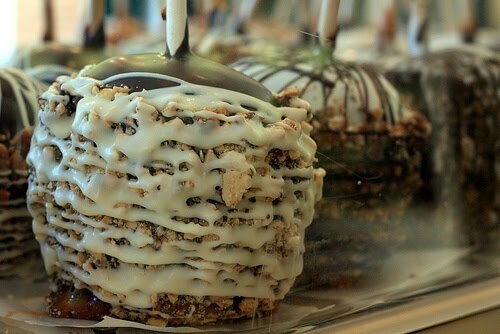 Well, it's an ooey-gooey candy apple as big as a softball dipped in chocolate and covered in nuts. We walked the entire store, careful to look at every case and shelf. To buy or not to buy? That was the question. Sadly, but responsibly, we walked out empty-handed. There would be goodies at the launch party afterall. With another half hour to waste we ducked into Scotland House, where I learned a valuable lesson. Maggie's calling is definitely writing, not personal styling. She tried to talk me into neon mini-kilt. A very bad look on a nearly six-foot-tall redhead. There was still time to spare, so we walked to the College of William & Mary Bookstore as slowly as possible, despite the 100 degree heat. Inside we grabbed a drink at the cafe and spotted the crowd of about 80 that had already gathered for the event. So, what did we do? We walked in the opposite direction, listening to passersby talk about how wonderful the Wolves of Mercy Falls books are and how excited they were to see Maggie, and that she might already be there! And we giggled. In retrospect, maybe the YA section wasn't the best place to hide out. We chatted about books and got spotted by more Maggie fans, including one incident in a public restroom. While we were lounging about, Beau, the events coordinator for the store, was running back and forth looking like he could have a heart attack at any moment. According to Maggie, her characters are "human impaired." She explained that the snob inside wants to believe that her wolves are not wolves at all but metaphors! Metaphors for losing your identity in an increasingly oppresive suburban society. But she admitted, "Okay, I know they're werewolves." Maggie shared that she had ambitions of becoming an author since she was small. She said that she began her first novel on her father's word processor at a very young age and even recalled the plot. It was the story of two dogs test driving a Porsche. The first line of dialogue was, "It, like, hugs the road." She conceded that, maybe, it wasn't the work of a NYT bestseller. Then read Chapter 2 of Linger, which introduces Cole. Fans got a chance to mingle with Maggie and get some food while Beau handed out raffle tickets and trivia cards for giveaways that would come later. There were Linger tank tops, Shiver tote bags, foreign editions of Shiver, a $20 B&N gift card and, of course, the super-fabulous Sharpie guitar covered in Shiver/Linger artwork. Sam and Grace buy two things at the candy shop, name one. What is Beck's first name? 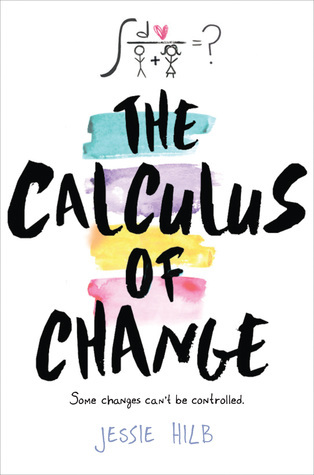 How many weeks was Shiver on the NYT Bestseller list before it went to paperback? What does Grace's dad do for a living? I felt like an idiot, but the last one was the one that stumped me. Of course, this drew mocking from Maggie. "He's a deep sea fisherman... In Minnesota! No... He's a Papa John's driver, Susan." She's a laugh riot, isn't she? I felt a little bit better when she started paging through the trivia cards and realized that no one seemed to remember what Mr. Brisbane did for a living. A Q&A came next and Maggie fielded questions about everything from the evolution of the Wolves of Mercy Falls trilogy and the Shiver movie to what character in the series she is most like. She didn't give a concrete answer for the latter, but she did say that her critique partner Tessa Gratton has a sneaking suspicion that she's Isabel. The girl just can't behave when I'm taking photos. Next came the cake! It wasn't just beautiful, it was delicious and I dare say that it outdid the Shiver cake from last year. The best part about it was that it was preservative-free and thusly Maggie-friendly. Maggie seemed to enjoy it. A word to the wise, don't stand between Maggie and sweets. Finally, it was time for the raffle and to announce the winner of the guitar Maggie had doodled all over. The winner got 14 of 15 trivia questions rightand was sporting a T-shirt that said "We warm up with coffee and Sam". She was pumped about winning. There was screaming and everything. There was a rush for the stairs when it was time for Maggie to head downstairs and sign. The line stretched down the center aisle of the store. 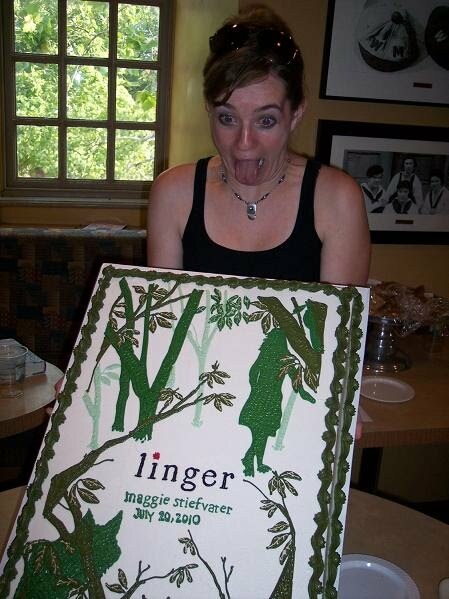 Maggie easily signed 100 copies of Linger. 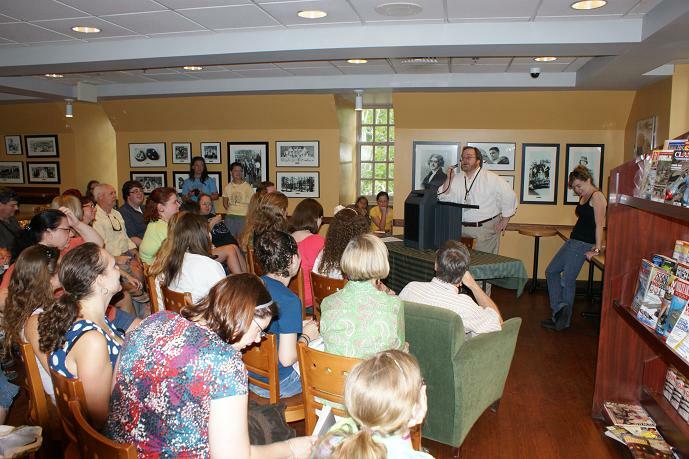 James from Book Chic Club, Louise from Twilight Moms, and I waited upstairs until the line shrank. Then I got some books signed for myself and one lucky reader. But before I tell you what I'll be giving away, I have to show you the hobgoblin that hides within Maggie Stiefvater. There are more demure versions of this photo flying about on the internet, but I like to think I captured Maggie in her truest form, after caffeine, sugar and two and a half hours of launch party festivity. Ends 8/11 at midnight EST. Up for grabs this time is a signed, doodled copy of Linger and a signed ARC of the new anthology Maggie has a story in, Kiss Me Deadly. Maggie hadn't even seen an ARC of the anthology yet, so you'll be one of the first people to have a signed copy. Thanks for the fabulous contest and it sounds like you had tons of fun! great post! i'm super sad maggie's tour didn't include the northwest, but i love that you posted video and pictures. thanks! what a fun post! 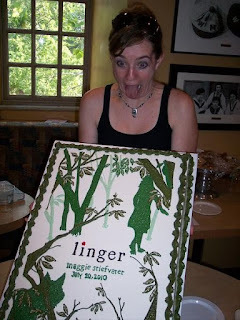 Maggie Stiefvater seems like so much fun! I loved meeting Maggie, she's hilarious! thank you for the giveaway and sharing about the event! I'm not from USA so.. :( So jealous of everyone there! sounds super fun! Haha, what fun you had :-D Thanks for all the great photos! And thanks so much for this fantastic giveaway and especially for making it international!! Thank you! Wish I could've been there. I think I would have just passed out if I won that guitar. Looks like it was a lot of fun! Thanks for the contest. The event looked so fun and I love Maggie. I just wish I can meet her someday. Thanks for the giveaway! Meeting Maggie looked like a lot of fun! Thanks for hosting - looks like you had a great time! Maggie looks like tons of fun! I love both Shiver and Linger and I'm so sad I missed her while she was here. Or, at least near where I am, anyway. Thanks for the contest! Could TOTALLY see you in a pink kilt, lol! Looks awesome! Wish I could've been there.